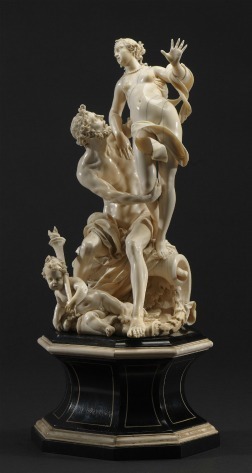 Two years ago, Sotheby's offered a 10¼–inch-tall ivory depicting Pluto, god of the underworld, abducting the goddess Proserpina, with a presale estimate of $120,000 to $150,000. It fetched $1.2 million. Now the same 17th-century sculpture is for sale at a New York gallery—for $3.8 million. How did this masterful piece -- notice the billowing drapery that swathes Proserpina, the muscles of Pluto, the intricate details throughout – gain so much value so quickly? In the auction catalog, Sotheby's attributed the piece to Matthias Steinl (circa 1644-1727) and dated it "circa 1700." Sotheby's also listed its distinguished provenance, which includes ownership by Baron Alphonse de Rothschild in Vienna until 1942, when the Nazis seized the carving and allocated it to Hitler's famed but never realized art museum in Linz, Austria. The sculpture was restituted in 1947 to the Austrian government, which turned it over to Baroness Clarice de Rothschild. But despite proportions and features typical of Steinl, once the foremost sculptor at the imperial court of Vienna, the piece was not definitively tied to him. Fewer than 10 ivory carvings by Steinl were known, and five are in the collection of the Kunsthistorisches Museum in Vienna. Thus, this sculpture—a scene in the myth in which Ceres cuts a deal with Pluto to allow her daughter Proserpina to return to Earth yearly, initiating spring—attracted fierce bidding from dealers. Two, Anthony Blumka of New York and Florian Eitle-Böhler of Munich, jointly won the lot, and that's when their work began. "The piece was in horrible condition," Mr. Blumka says. They had it cleaned and restored to its original state, complete with pieces that had been missing. They also began a raft of research. Then, says Mr. Blumka, "we took it to Munich for a major Baroque symposium, where it was studied by all the relevant Baroque scholars." All, including the foremost authority, Christian Theuerkauff, agreed that the piece is by Steinl and dated it "circa 1690," about the same time Steinl had carved his famous ivory depictions of Emperor Leopold I and King Joseph I at the Kunsthistorisches Museum. With its newly confirmed authorship, the piece was displayed last year at the Liebieghaus Sculpture Collection in Frankfurt in an exhibition called "Ivory: Baroque Splendor at the Court of Vienna." "It is quite a sensation that this masterpiece, which was known to scholars only through an old photograph, taken when it was in the Rothschild collection, has re-emerged," says Eike S. Schmidt, the curator of decorative arts and sculpture at the Minneapolis Institute of Arts and the author of several books on ivory sculpture. It is, he adds, "certainly one of the most outstanding ivory sculptures that were made in Austria in the Baroque age." The piece will be shown at Blumka Gallery in New York, part of the "Collecting Treasures of the Past VII: European Works of Art of the Medieval, Renaissance and Baroque Periods," from Thursday through Feb. 10.